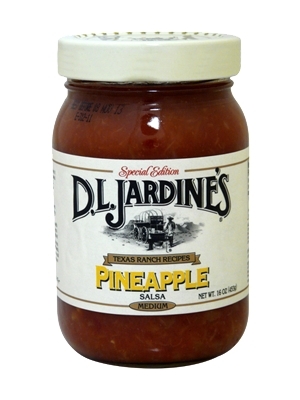 The fresh, fruity taste of our Pineapple Salsa is the perfect complement to grilled chicken, ribs, fish and has been known to help grill masters everywhere win rave reviews. Enjoy as a dip with chips or baked over chicken, fish or pork for a simply delicious (and easy!) weeknight meal. 16 oz. Diced tomatoes, pineapples, water, suagr, green chilies, tomato paste, jalapeno peppers, pineapple juice concentrate, salt, bell peppers, lemon juice, dehydrated minced onions, dehydrated lemon peel, dehydrated garlic, natural coconut flavor, ground comino, xanthan gum, ground coriander.